Explorer created a 3D series of Bus Timetables for Dubai’s Roads & Transport Authority. 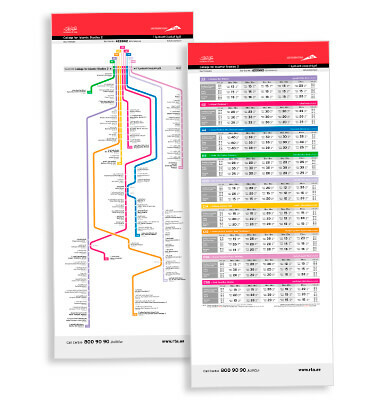 With bold colour-coded lines showing bus routes and times and well-designed arrows to indicate directions, the city’s efficient bus network is artfully represented in an eye-catching format. For this product, Explorer drew on their expertise, experience and award-winning team of designers to deliver an up-to-date product, featuring Dubai’s buses, landmarks, locations and latest schedules.